Back in July I wrote a post about my son and a potential undiagnosed gluten intolerance which we felt was affecting his day to day life. Off of gluten, his health, mood and sleep improved and the more we persisted, the easier we found it to stick to. There are a lot of great alternatives available, although not always cheaply, and so we’ve stuck with this diet. However with him due to start preschool next year, and controlling his diet about to get a lot harder, we wanted some answers. No one wants to tell their child they can’t join in with the birthday cake and definitely not unnecessarily; as mentioned before although we were all convinced, it’s very hard to be certain with a child who is just developing language skills. 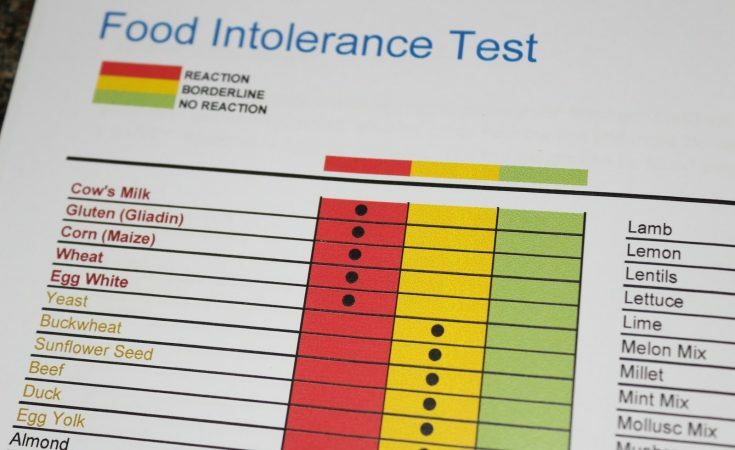 With the NHS unable to provide testing for intolerance other than an elimination diet, I turned to YorkTest Laboratories. A close friend had taken the YorkTest, and as a result had eliminated her trigger foods some years previous and said she’d never looked back. As a natural sceptic who had researched myself into circles, I thought we’d take the test, and see what it came back with. 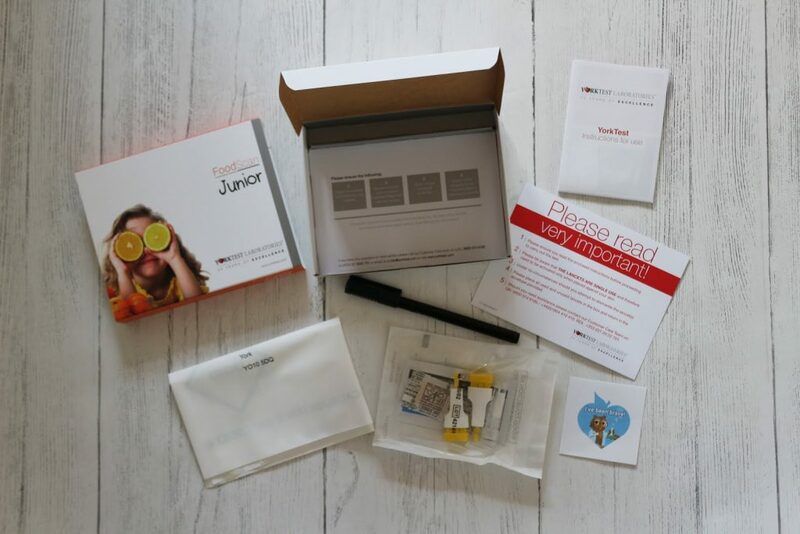 YorkTest were happy to send out a Foodscan Junior kit to us. 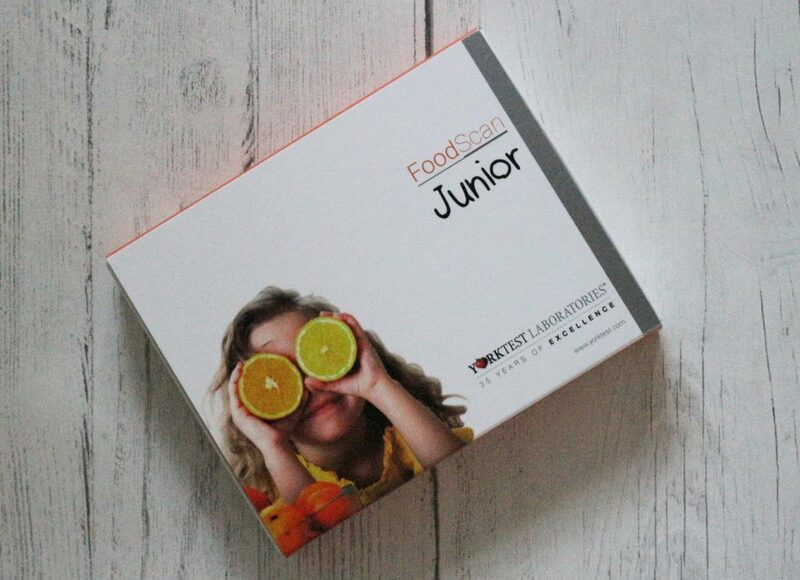 The Foodscan Junior kit is suitable for children aged two and above; perfect for the small one who is now two. It tests blood for an immune response to 113 different foods. To make sure that we wouldn’t get a false negative result, we added small amounts of gluten back into his diet. Now I’ll admit, I was actually worrying myself silly about getting blood from him, as I imagine any parent might. We waited until bedtime, and told him we needed to send off some of his blood to find out why his tummy hurt and that it would only hurt for a second. He didn’t flinch at all, and was made up by having a sticker AND a plaster. He loves a plaster. The blood quickly saturated the blood swab, we placed it into the tube and then placed that with the used and unused lancets and the signed form into the envelope, and popped it into the post. A week later, we got the results in the post. That’s a fair bit of stuff to avoid. Although the gluten and wheat didn’t come as a shock at all, the dairy in particular surprised me as we had previous tried cutting this out to no avail but there it was, right at the top! I had no idea where to start at all, so I made an appointment with their nutritional therapist which was supplied as part of the Junior Foodscan package. The nutritional therapist called exactly when she said she would. Now be aware, that a nutritional therapist, unlike a dietitian, is not medically trained. I think this is an important thing to remember as a lot of what they talk about is theory rather than scientific fact. Some is very well regarded theory, and other bits are less so. The nutritional therapist talked a lot about leaky gut; and whilst it makes sense that while his intestinal tract is still trying to repair from whatever he does react to, therefore making the list of reactive foods seem very high, leaky gut is not something that the NHS recognise as a condition. She recommended a probiotic and after consulting the NHS website which said that scientific studies had been shown to be helpful in some cases, I thought it was worth trying. It was a helpful consultation. We spoke about foods that he could have as replacements for those that are on the ‘list’ and she made it clear that it was about minimising; these are not allergies and a small bit of something is not going to harm him. Good job too because I would say it would be a full time job feeding a child with such an extensive list of no-gos; having children with multiple allergies must be a nightmare to manage. As it is, he’s growing and is better than he was; if he was seriously ill obviously we would cut everything suggested out but I don’t have time to bake bread from scratch from expensive ingredients you can only buy online, so the fact that gluten free bread has egg white in it; I’m sorry son, you’ll have to make do. However, what it has given me is confidence that our own diagnosis of a wheat intolerance was not completely random. We’ve taken maize snacks, dairy and as much egg as possible out of his diet for a few weeks. Personally, I haven’t noted a difference over and above the removal of gluten, so will be gradually reintroducing these after 6 weeks whilst keeping a diary as provided by YorkTest to document any effects. Thank goodness because he’s dying for a Wotsit. Thank you so much to YorkTest, who let us take the Foodscan Junior blood test for free for the purposes of this review. It’s been an interesting ride – a real eye opener really – and it’s definitely cemented in my mind that for the time being, he is better off of certain foods. After the initial six weeks, we added the red foods back in (except for gluten). We saw no noticeable ill effects. We will be testing him on gluten periodically to see whether he has grown out of his intolerance but for now we are keeping him off it. He is much happier that way! 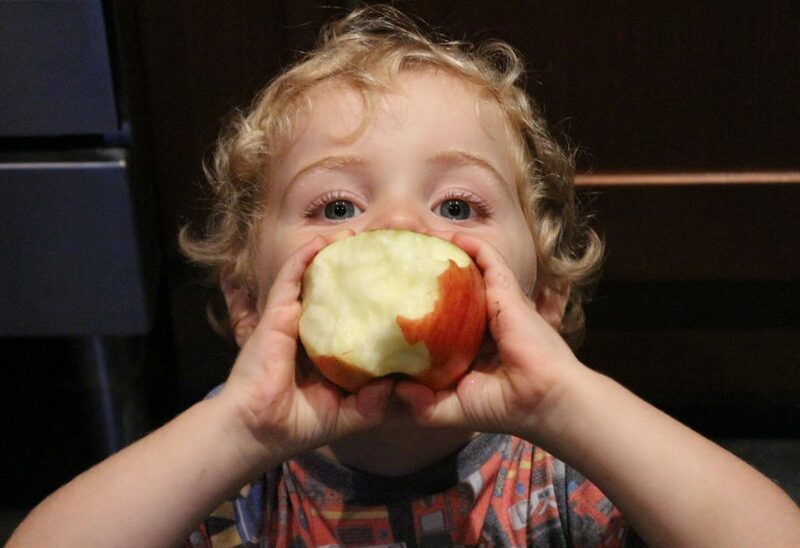 If you think you or your child is reacting to foods in their diet, you should of course see a GP. 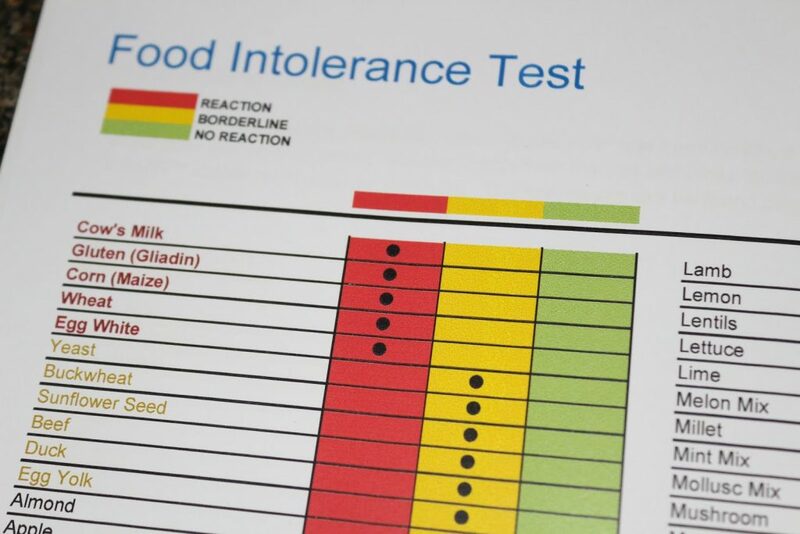 If an elimination diet is suggested and you don’t know where to start, the YorkTest Foodscan and Foodscan Junior can be used to help pinpoint reactive foods and provide a starting place. The cost of the test is £250 which includes the blood test kit and results, and two consultations with a registered nutritional therapist. You can find out more on their website here. Ive been looking into this York test for myself. The IBS one. Is it really any good? Its such a lot of money? As an adult if I was suffering and I couldn’t work out what it was via an elimination diet/through visiting my GP, I would probably invest the money. A close friend had an IGG test 20 years ago and she was the one who suggested it for my youngest; she says it’s the best thing she’s ever done. It is difficult to say because affordability very much depends on circumstances but she truly believes that she has her test to thank for her health. Very informative Article. York test is also useful to detect the main triggers of Irritable Bowel Syndrome. As a patient of IBS, York Test proves itself a blessing for me. Thank You for such a nice sharing.